FACS stands for "Fluorescence Activated Cell Sorting." The FACS machine has revolutionized biology by allowing researchers to isolate cells based on their spectral qualities. For example, if you have a fluorescently tagged antibody that preferentially binds to a certain cell type, you can isolate a pure sample of this cell type from a complex mixture by using a FACS machine. In addition to purification, the FACS machine can count the number of cells that have a certain spectral quality. 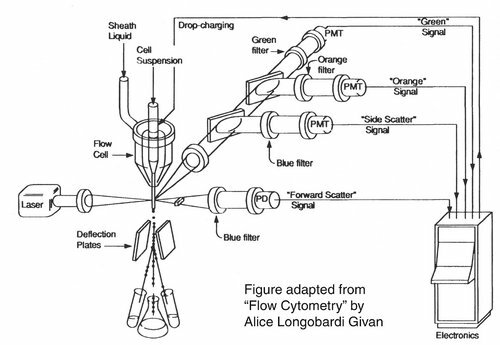 If a FACS machine is used just for counting and not for separating subpopulations of cells, then the procedure is called "flow cytometry," and this is what you will be doing today. For FACS, the spectral qualities of the cell are analyzed nearly instantaneously and compared to your desired spectral qualities. For example, if you have a mixture of green fluorescent cells and non-fluorescent cells, you can ask the machine to isolate the green cells. If a cell registers as green, an electrical charge deflects the cell to make it fall into a collection chamber. The following protocol should be performed in the sterile hoods unless otherwise indicated. Add 200 μL trypsin to each well, aliquotted with a 2 ml pipet. After the last addition, start a 1’ timer. During this time, rock the plate in each direction to distribute the trypsin over the cells. Resuspend the cells in 100 μL OptiMEM, using your P200 to make an even suspension. Move each sample to a labeled FACS tube---pooling the triplicate samples to insure that you have enough cells for FACS. 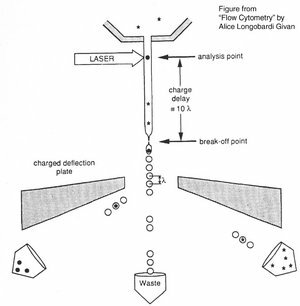 Carefully observe the TA as she runs the flow cytometry machine. Be sure to ask questions if you don't understand the purpose of any step. Ultimately, you want to compare the percentage of green-fluorescent cells in each sample. Please submit your finished "memo." This assignment is due by 11:00 a.m. on the day you have lab. Please turn in your memo electronically by uploading it to the Stellar website that is associated with our class. It is important that you name your file according to this convention: Firstinitial_Lastname_LabSection_assignment.doc, for example: S_Hockfield_TR_memo.doc There will be a 1/3 letter grade penalty for each day (24 hour period) late. If you are submitting your assignment after the due date, it must be emailed to nlerner, lsutliff, nkuldell and astachow AT mit DOT edu. There will be no re-write option on this assignment. Begin to familiarize yourself with the content of the second experimental module by reading the front page for the module as well as skimming the introduction to the first day of labwork. This page was last edited on 7 September 2009, at 19:57.